Do people step back when you get close? Brush their fingers under their nose when you are near? Turn their head? Offer you gum or mints? Or, any other social signs that indicate you are not welcome in “their space”? If so, you probably have bad breath. If this happens to you, forget the gums, mints, toothpastes, and mouthwash! These are all cover-ups, not cures. No matter what they taste like, they only cover-up one bad odor with a stronger one. Even, the cure-in-a-bottle Internet products are only cover-ups not the all-day cure they advertise. 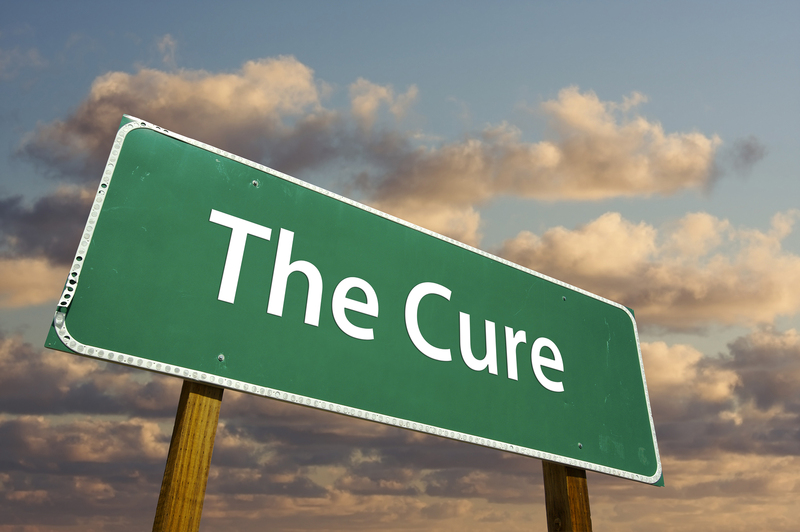 Since 1993 a complete cure has been available that creates life-long fresh breath that is sustainable for life. 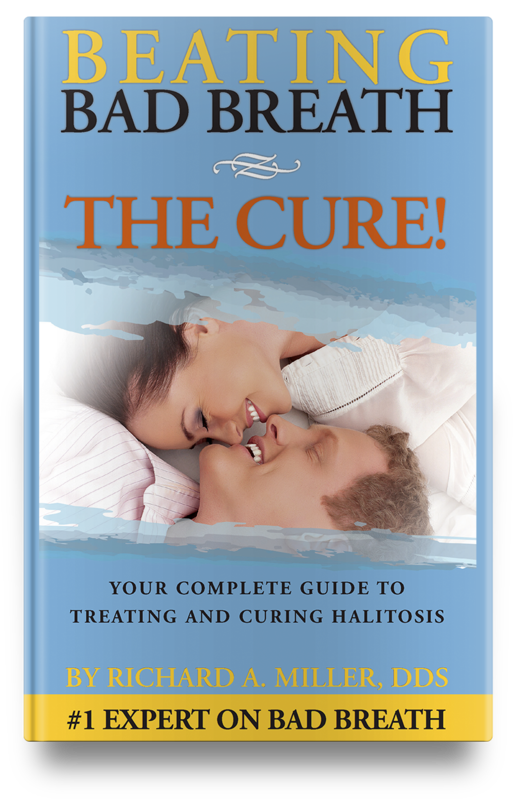 It has changed the lives of thousands of the 40 million Americans who are affected by halitosis. Bad breath is due to the bacteria that inhabit the mouth, particularly those on the tongue, under the gums, and between the teeth. These bacteria form biofilms (coatings) that can only be removed by special mechanical means. By professionally eliminating those bacterial biofilms one can be halitosis-free forever! If you want to check yourself, here is the best self-test available. Take a piece of sterile 2” x 2” gauze, available at every pharmacy. Stick your tongue out as far as possible. From the furthest back area that you can reach, wipe forward 3-4 times to get off as much coating as you can. Compare the color to the white part of the gauze. Is the gauze discolored? Wait one minute. Smell the gauze. Is there an odor? If you see a color on the gauze OR smell an odor, you have halitosis. Can’t smell anything? It might be the sensory phenomenon called adaptation.That is why the color of the gauze itself, is an indicator of bad breath. “Rotten Eggs” or “Dirty Socks” Breath? As you may already know, breath odor smells like “rotten eggs” that comes from hydrogen sulfide in the mouth, and the smell of “dirty socks” is caused by methyl mercaptan, another strongly smelling sulfur compound in the breath. In addition, the same bacteria that cause gum disease produce these sulfur compounds. It is the elimination of the biofilms on the tongue, between the teeth, and under the gums as well as the neutralization of the odors that is the cure for bad breath. 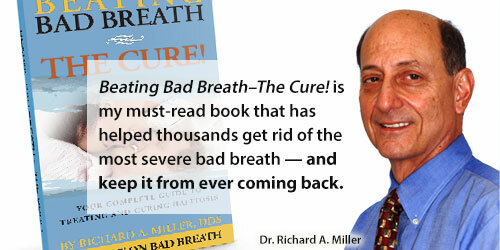 So, if you have bad breath, there is another way — a way to say goodbye to bad breath forever!